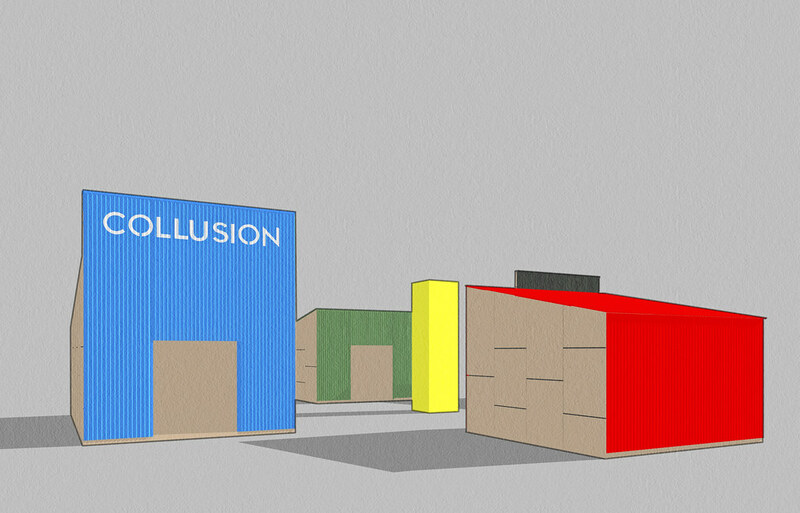 The Collusion 2019 Pavilions, designed by architect Charles Holland, are four structures each with its own unique shape, size, and colour – purpose-built to house six artworks commissioned for the Collusion 2019 showcase, which runs from 12 to 22 April outside Cambridge Junction. A sort of pop-up analog digital village, the Pavilions form a temporary gathering place where the public can be immersed in artworks incorporating emerging technologies while questioning their social impact. The materials used reflect the themes of the exhibition, with corrugated tin echoing the rawness of industrial buildings or technology parks – places whose activities tend to be enclosed and mysterious. In this case, however, the community is invited in to explore hitherto obscured ideas. The Collusion Pavilions are designed with sustainability of materials and reuse in mind, and will be saved and reconfigured for future exhibitions. Before forming international architecture and design studio Charles Holland Architects, Charles Holland was a founding director of Ordinary Architecture and a director of FAT. Whilst at FAT he was the director in charge of a number of key projects including A House For Essex, the practice’s collaboration with Grayson Perry. Alongside his practice activities Charles is involved in teaching, writing and research. He is a Professor of Architecture at the University of Brighton.